In the last year or so I've seen a resurgence of Greek tragedies, the latest being Medea by Euripedes at Zombie Joe's in North Hollywood. A word here about tragedy. We tend to think of that word in terms of Shakespeare, the hero with a tragic flaw, etc. No so the Greeks. They saw the universe itself as inherently tragic, and all who live in it ultimately doomed. Heroism and drama lay in how one meets their doom. Medea proved ground-breaking, because it turned the usual interpretation of this myth around. Different versions of Medea tended to see her husband Jason as the hero, the man whose attempts to do right are thwarted by the madness of his wife. Euripdes, however, took Medea's side. He saw Jason's betrayal of his bride as the doom with which she had to cope. Yeah, Euripedes was not unlike the Lady Gaga of his day. Jonica Patella plays the title character, and as fans of this local actress might expect, she turns in a powerhouse performance. Here is a woman who fell in love, committed treason for her husband, even killed her own brother for his sake--only to have Jason dump her (and their children) to marry the daughter and only heir to the King of Corinth. In the face of this, she literally screams to the heavens and decides to enact a most terrible revenge. Denise Devin directed and adapted this play, over twice the age of the language in which we experience it. Think about that for a moment. About what it takes for such a work to last! Its style should feel archaic and difficult to grasp, yet in fact in the tiny black box on Lankershim the story very much comes alive. A chorus of three women (Cristina Brunet, Dawn Davis, Dicle Ozcer) become Medea's confidants as the Nurse (Louise Claps) explains to them the situation. Eventually Creon (Dale Sandlin) King of Corinth enters to banish Medea and her children--turning them into stateless refugees. All this plays out vividly and with precision, but what really brings out the drama of it all is when Alex Walters enters as Jason. 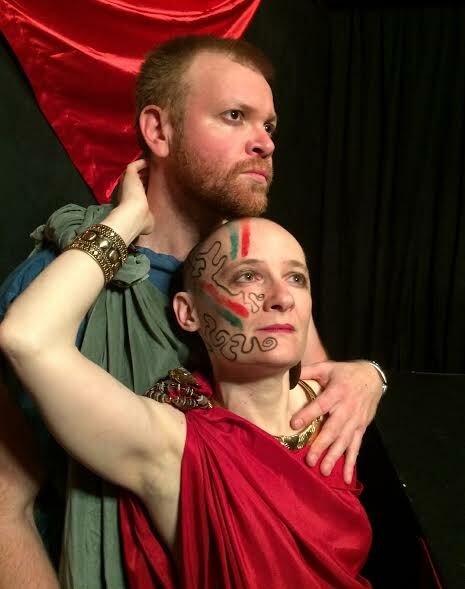 Because Jason and Medea as a couple remain the beating heart of this tragedy. Not until we see them together do we understand how these events were inevitable. 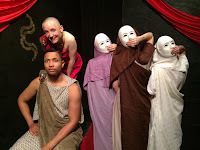 Personally I'm a big fan of both these actors, and while the whole cast (including Larray Grimes in a multiple role as Aegeus, a Messenger and a Dragon) do fine jobs, with nary an off note or wrong gesture, it is Patella and Walters who carry the weight of this tragedy--carry and run with it. We can see the passion that burned between them still! More, we see not a deliberate cruelty but an all-too-common myopia on the part of this hero (he is after all the leader of the Argonauts, whose quest for the Golden Fleece proved successful--think of him as a combination of Frodo and Aragorn). He feels some guilt for his so-called betrayal (that is how he would describe it) but mostly he judges his wife for daring to judge him. But hatred and love are not opposites. They are two sides of the same coin, and we can see that in Patella's Medea. Once wronged so terribly, her seething and ruthless hatred becomes terrible. She loved Jason. Maybe part of her loves him still. So she totally destroys him. And destroys part of herself in the process. A fascinating piece of theatre, a horror story not about monsters or serial killers but about the darkness petty and grand of the human heart. 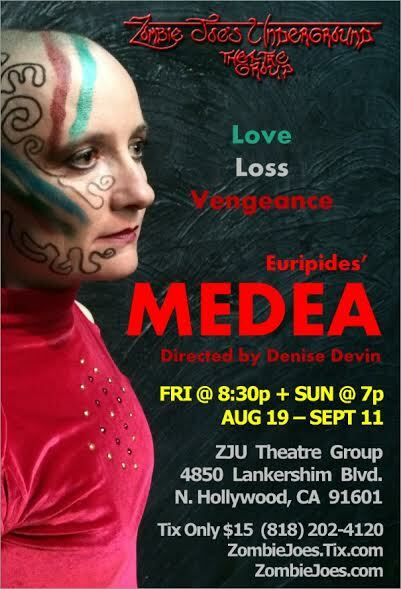 Medea plays Fridays at 8:30pm and Sundays at 7pm until September 11, 2016 at ZJU 4850 Lankershim Blvd. (just south of the NoHo sign) North Hollywood CA 91601.